Many people are disappointed that a popular, stylish, award winning drama is being shown in the USA, but canât be viewed until later in the year by BBC iPlayer people. Who, of course, feel that they pay Â£155 to be able to do that. This has been true for some time. Given that I am a huge fan of the late Douglas Adams, I was utterly thrilled at the new version of Dirk Gently that BBC America produced. 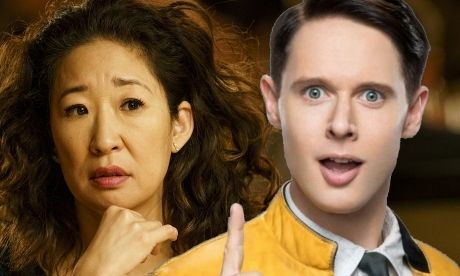 Just like Killing Eve, Dirk Gently's Holistic Detective Agency was a modern, waspish, stylish and somewhat bonkers take on the holistic detective. Whilst remaining true to the original books (of which there are sadly only two and a half) the new series took the themes and characters to new places. Harry Enfield was a great (Dirk Maggs produced) Radio 4 Dirk, and Stephen Mangan excelled being Dirk on BBC Four, but History Boy Samuel Barnett was a new-style Dirk Gently. I was, therefore also very, very, very disappointed indeed that the series wasn’t renewed after the second season. I was even more disappointed that BBC television viewers have never seen Samuel’s Dirk unless they subscribe to Netflix. The issue here is that BBC America has paid for the dramas to be made. BBC America is a 50:50 co-operation between BBC Studios and AMC Networks. BBC Studios is the name you see at the end of lots of BBC television shows. It is both the production company of the BBC (29%) and the worldwide part (71%). The worldwide part of BBC studios operates all those ad-funded channels that show repeats of BBC shows (and some of their own content, such as Taskmaster). Part of the worldwide part of BBC Studios operates joint-ventures outside the UK to make a profit. This is intended to allow the BBC to operate in the UK on less Licence Fee money. Another upcoming BBC Two show starring David Tenant and Michal Sheen is also going to be shown on non-BBC streaming service first. Good Omens, based on the Terry Pratchett and Neil Gaiman book is going to premier on Amazon Prime Video many months before it can be seen by other License Fee payers. Because I saw that Killing Eve was released in the US and the series two ep 1 was to be shown on RTE2 last night, and being an Irish person in the UK, I downloaded the RTE app with anticipation and excitement. BUT, the only programs that I could get into were ones about plughing matches, and a tour of Irish lighthouses,and similar. As I was not going to work on any of my fields, and because my Corical was in dry dock for repairs, these fine programs were of small use to me. I iterrogated the internet and found that one can only watch any national TV broadcasts in the home countries unless you purchased a VPN number. So again foiled by the real rulers of the world, like rupert bear (murdoch ) and his cohorts. I supose I will have to wait for Eve, a pity, I do like her. Is it something to do with brexit? Anthony J B Graham: That has nothing to do with Brexit. RTE have only purchased the rights to show it in Ireland. The BBC hold the rights to show Killing Eve in the UK, RTE would face legal action if they made it available on their catchup player outside of Ireland.